We’ve just announced the new certification in TLA (http://tlanetwork.org/certification), and already there’s ample interest and some great questions. To help answer questions, I’m interviewing myself, trying to address all I’ve been asked and all I can imagine. Please feel free to ask additional questions in the comments. Me: Caryn, so good of you to meet with me. Caryn: Anytime. You know I’m always close by. Me: That’s so reassuring. So let me kick off this interview by asking why now when it comes to the TLA Certification. Caryn: For many years, we’ve been talking about a TLA certification. For over six years, we worked at Goddard College to develop this option in MA in TLA concentration for people with vast experience in the field. Because of new Department of Education regulations regarding new certification restrictions when it comes to educational funding, we realized the college certification program wasn’t feasible at this time. In further conversations, some of us at the college and in the TLA Network realized that the not-for-profit TLA Network was a much better home for the certification. We developed this certification to give people a rounded introduction to all things TLA. “Why now?” has to do with several factors: the launch of the certification coincided with the Power of Words 2014 conference because that was a good way to talk about face-to-face with those who were interested. We also just signed a partnership agreement between the college and the TLA Network, and that agreement grants people who complete the certification a scholarship of $1,000 for any Goddard program (spread over two semesters). Me: Who is this certification for? Caryn: I’ve been in touch with people who want to study more about TLA, put it into practice in their lives, but for whom getting a graduate degree doesn’t fit right now. I’ve worked with several students at Goddard who already had doctorates, and ended up coming for a semester to immerse themselves in TLA. There are also people who want to do the Goddard program, but the timing isn’t right. Finally, there are some who want to infuse their professions and livelihoods with TLA — from pastoral counselors to teachers to psychologists to activists to artists. This certification speaks to various ways to develop TLA, including active participation in TLA activities in your community and over distances, investigation and study on how TLA is practiced and could be practiced, and ways to enhance your individual practice of TLA, whether that’s storytelling or writing or collaborative community projects. This certification helps people incorporate TLA as an art, study, practice, form of advocacy and celebration in their lives. Me: You mentioned the Goddard program, and so I wonder how the certification compares to the Goddard program? Caryn: The certification provides participants with a thorough orientation to TLA, some avenues for developing a TLA practice and connecting with others involved in TLA, and encouragement to be part of the TLA community, help grow that community, and further define and develop TLA in the world. The Goddard program is a much more intensive immersion into TLA because its core is master’s level degree criteria focused on theoretical groundwork in TLA at large and intensively in a specific focus; a deep development in the individual art of TLA, such as writing a memoir or putting together a collaborative performance; and an in-depth community practicum, such as facilitating a series of storytelling workshops, teaching yourself filmmaking for change, or doing some other project that helps people interface with their communities. We’ve designed the certification to be both freestanding as an educational journey, and/or complementary with the Goddard MA-TLA as a first step or a way to develop a plan for right livelihood after graduation. Me: How is this certification different or the same as other certifications? Some certification in related fields are much more intensive and focus on a specific approach, such as the certification in poetry therapy offered by the National Federation for Biblio/Poetry Therapy, which I did and found very helpful. That certification takes people at least two years, and is more involved in terms of the hours and costs. Some certifications are shorter when it comes to the length of time, such as the Amherst Writers and Artists week-long intensives. Yet both the certifications I just named advocate and train people for a specific approach in working with certain populations, a model for how to do workshops. The TLA certification is far less expensive than many programs out there, and it’s also open-ended as to people’s approach (although people who complete our certification may go onto other learning opportunities and vice-versa). That’s because we’re TLA: we bring together people involved in storytelling for social change, writing for healing and growth, spiritual adventuring through theater, and much more so that we can make and keep community across using words aloud or on the page for change. In the “Changing the World With Words: TLA Foundations” course, we offer people exposure to multiple approaches, encouraging people to learn about what fits their calling, community, and focus, and then to educate themselves on specific models for workshops, consulting, coaching and more. The certification incorporates involvement in the TLA community through attending conference and/or participating in classes, and participating in various projects, such as One City One Prompt, or Chrysalis: The Journal for TLA. So overall, this certification is based on coursework and reflection, and but also on action learning through doing TLA. Me: Is this the only certification in TLA that will be offered? Caryn: This is a first step, and as a community focused on growing our hearts and minds individually and collectively, we’ll be tweaking and enhancing the certification components as we go. I can imagine a more advanced certification option in the future, either through Goddard or the TLA Network. Me: How much would this certification cost the average person? Caryn: We’ve worked to make the certification affordable for people from many backgrounds. The application fee is only $40, membership in the TLA Network is $35/year, online classes are approximately $35/week, and the conference ranges from $160 for super early bird registration to over $200 for regular registration, plus room and board, and for some, travel. The certification overall would cost $500-$1,000 (depending on conference attendance, travel, classes taken, etc.). People can spread out what they do and when they do it over two years. While this might seem like a big number, it’s significantly less than some other similar certifications (although those certifications can be extremely valuable and do have different focuses). Me: Who makes decisions about who gets in and who completes the certification successfully? Caryn: We have a small committee reviewing applications for certification right now, and this committee will be reviewing completed certification evaluations and reports by participants at the end of their certification road trip. I believe it’s important that decisions are not based on any one person’s read, but from the collective wisdom of people with experience in the TLA world. As time goes on, we will surely reach out to people who completed the certification to serve on this committee. Me: How would people get started? Caryn: The first step is to click on and fill out the application (http://TLAnetwork.org/certification) and pay the $40 application fee. Within several weeks, we’ll be back in touch. Once you’re accepted, you can sign up for classes, join the network if you’re not yet a member, and take other steps. It’s advisable to start with the “Changing the World with Words: TLA Foundations” class to help you map out your focus. Within a few months of starting, we will be in touch to ask you to fill out your certification plan (what options you’ll be pursuing), and we’ll be available to meet briefly on the phone to help you talk through those options. 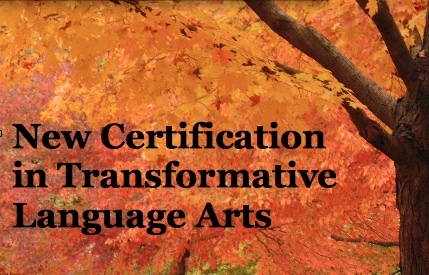 More information at http://TLANetwork.org/certification and the upcoming online class, Changing the World With Words: TLA Foundations.